Strawberry fruit juice to prevent formation of dental plaque that can trigger the appearance of the teeth and mouth disease, said researchers from the University of Muhammadiyah Yogyakarta, Rahmi Amalia Ayu Budi. "The content of the natural sweetener xylitol and polyphenols in the form of strawberries proved capable of reducing the colonization of 'Streptococcus mutans' which can inhibit the enzyme activity so as to prevent the formation of plaque," he said in Yogyakarta, on Monday. Thus, according to him when describing the results of his research, strawberry juice consumption have a significant effect in reducing dental plaque index. 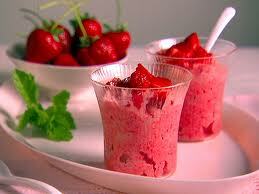 He said that, in general, strawberries contain nutrients such as protein, fat, carbohydrate, and energy. Potential minerals contained in it is calcium, phosphorus, iron, magnesium, potassium, selenium, vitamin C and folic acid. "Strawberries are also shown to have antioxidant activity two-fold higher than red wine, five times that of apples and bananas, and ten times more than the watermelon," he said. So, according to him, strawberries has many benefits for human health, including reducing the accumulation of dental plaque which can prevent the emergence of the teeth and mouth disease. He said the plaque is the main cause that triggered the emergence of dental and oral diseases, including caries (tooth decay), calculus (tartar), gingivitis (inflammation of the gums) and periodontitis (inflammation of the tissues supporting the teeth). "Given the plaque formation is a process that can not be avoided, hence reducing the accumulation of plaque into boiling things important in preventing the formation of teeth and mouth disease. One of them with strawberry juice," he said. According to him, with strawberry juice, the taste will stimulate acid secretion of saliva in high amounts. As a result, become more watery saliva and salivary viscosity becomes lower. "Finally, dental plaque can be reduced so that the appearance of the teeth and mouth disease can be prevented," said student study program Dentistry, University of Muhammadiyah Yogyakarta (UMY) it.